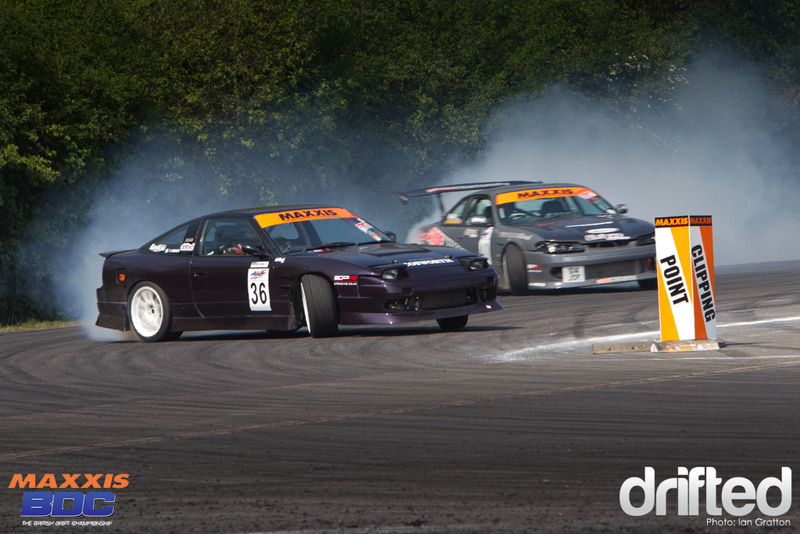 Easter weekend presented us with Round 1 of the British Drift Championship at Donington Park in Derbyshire. In the few days leading up to the event BDC main man Mark ‘Sweeps’ Buckle asked the drivers what kind of track layout they would like for the weekend. Fast and flowing? Tight and technical? A wall to run maybe? The Launchpad at Donington is a large 400m by 150m expanse of super smooth tarmac that is situated behind Redgates corner on the main circuit. This clean sheet of tarmac allowed the BDC organisers to build a track that would test the drivers to the maximum. Competitors started out with a 250m blast down the right of the Launchpad leading into a long left-hander across the entire width of the available space. How drivers choose to initiate the large entry into the sweeper was largely down to the amount of power on tap and driver experience – some opting to pile on speed and then initiate with a short tug of the handbrake to slow the car a little – others (the more powerful cars) opting for a fast manji-style flick at full speed opting to adjust the cars speed in the first part of the turn. Drivers then pile back on the speed and increase their angle through a short straight section along the tree line. Those opting for a wider line round the big corner would have to deal with the dirt at edge of the trees. 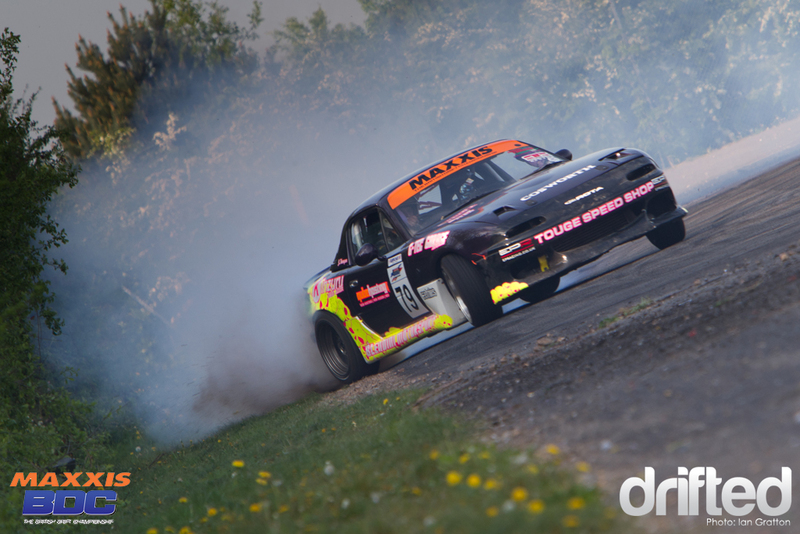 Jamie Kenyon above peppers the tree-line with a dirt-drop in his SR20’d MX5. For drivers who could carry a lot of speed through the sweeper the tree-lined straight simply became an extension of the first turn. 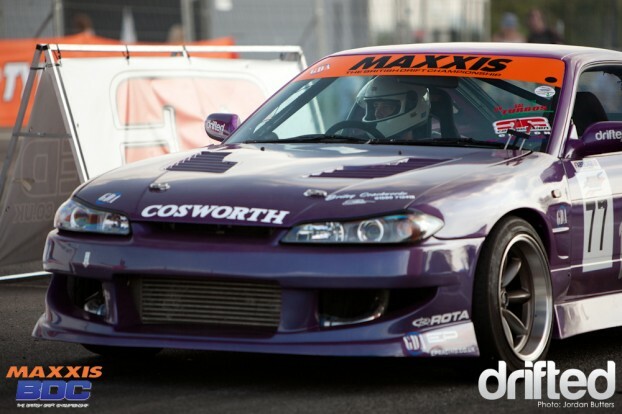 Mark Luney in the SATS Cosworth Supra consistently took this approach. At the end of the tree-lined straight drivers then head left into a fairly open chicane targeting a frontal clipping point. Phil Morrison is caught here on a gentle run through the course (minus a smoke screen for once!) 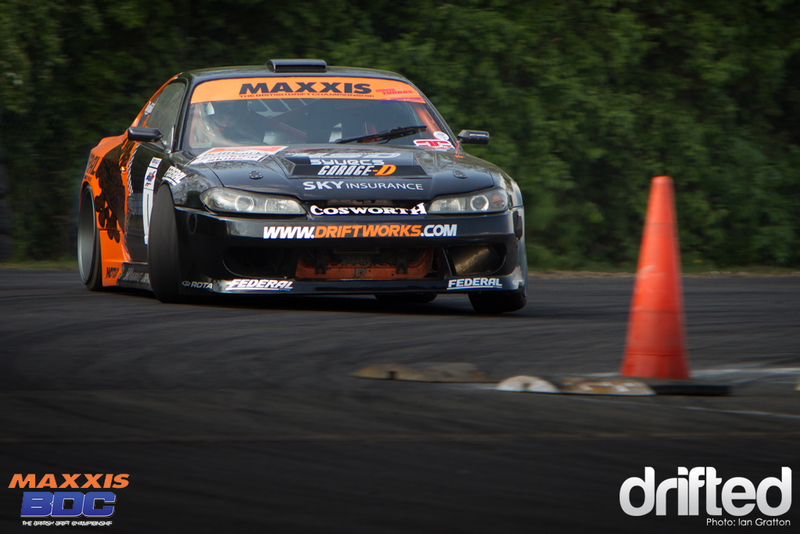 giving us a nice clear view of Driftworks S15‘s new 2011 livery. This truly spectacular car is a rolling advertisement for the Driftworks Awesome Fest weekend that takes place at Mallory Park later in the year. 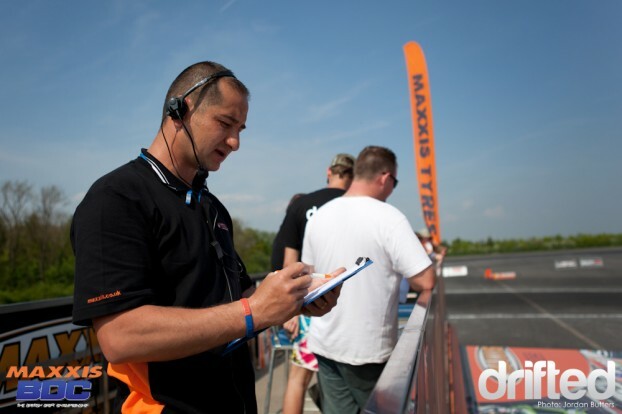 ….in front of the judges (Garage-D’s Julian Smith, Steve ‘Stiggy’ Evans, and Mitch Clarke, pictured) who were placed up high in the MAXXIS hospitality truck for a perfect view of every clipping point. Another flick right after the wall before drivers have to to kill off a substantial amount of speed to prepare for the tight 180 degrees left hander – a quick flick back right and over the finish line. 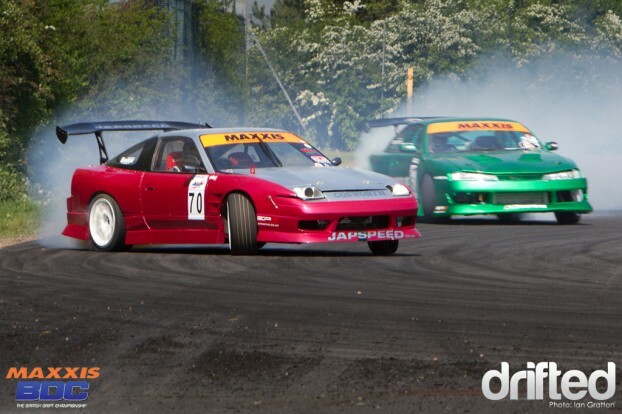 The number of competitors in this years championship is simply incredible – it really shows how much more seriously people are beginning to take the sport of drifting. 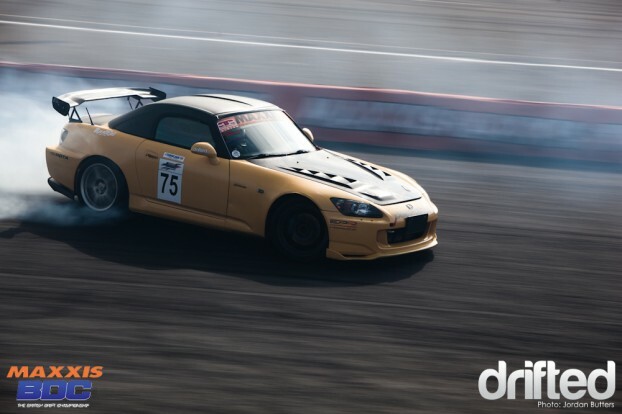 Many forms of motor sport stifle their competitors by enforcing caps on vehicle type, power, aerodynamics and tyres – but drifting isn’t like that at all. Safety is of course absolutely paramount for both competitors and spectators alike but I believe this freedom to progress is one of the key reasons why people are captivated by newer breeds of motor sport like drifting and time attack – just like I was with Group B rallying back in the day. Walking down the pit lane (or taking a mini-pit bike?) takes some time as there is now a large number of machines to take in. 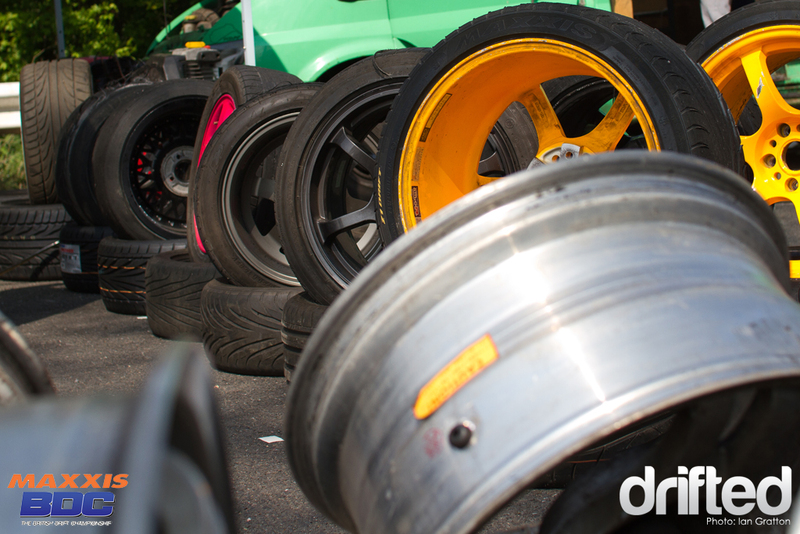 An impressive 84 drivers in total over three classes – Semi-Pro, Pro and Super-Pro. Semi-Pro and Pro drivers are licensed accordingly based either on previous season’s performance or through frequent license days held in the off-season. Super-Pro is a new class for 2011 created for the best drivers in the finest machines, it is made up of the top seeded drivers from the 2010 Pro class. Phil Maclachlan’s stunning LS1-powered PS13 Silvia unfortunately had some gearbox/drive-train issues and wasn’t seen other than briefly in morning open practice. We hope the teething troubles with the car pass as we can’t wait to see it in more serious action! Team mates Roger Cooling and Christian Lewis continued on to finish in the top 10 of the Semi-Pro class later in the weekend. 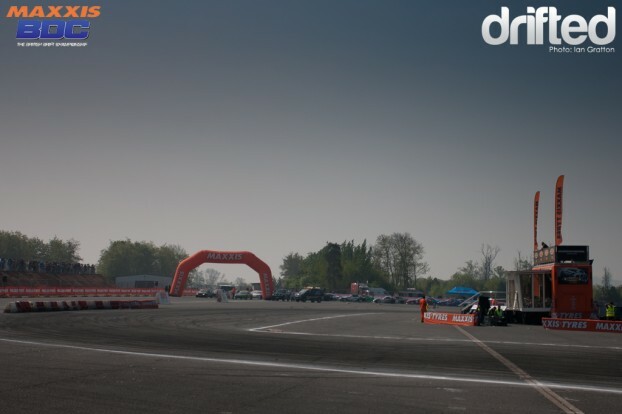 Another change for this season is that events are to be run over 2 days, with shakedown and qualifying (Semi-Pro and Pro) on the first day and qualifying (Super-Pro) and competition on the second day. This means despite the huge amount of competitors there is still seat-time galore for the drivers and a feast of action for spectators and fans to take in. And obviously plenty for us to fill our memory cards with. Lets take a look at the Semi-Pro and Pro classes respectively. A place I love to focus attention at competition events is the start line. It’s the last chance to get to get a close-up look at the drivers before they set off on their runs. 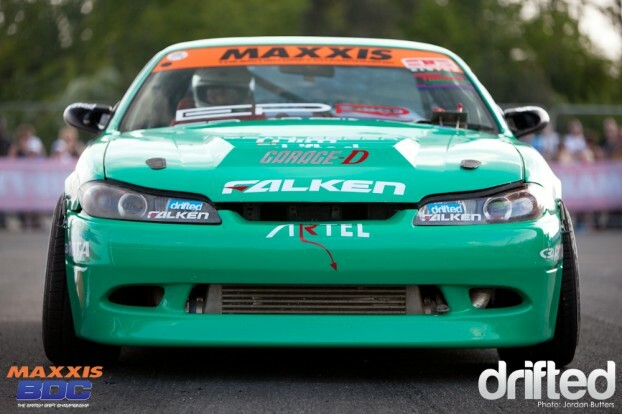 Above Team Falken’s Alan Green focuses on the long run-up ahead. Some drivers, such as Daniel Hall in his maiden season, shoot a momentary glance across at their opponent. Is that anxiety in his eyes or an attempt to sike his fellow competitor out? 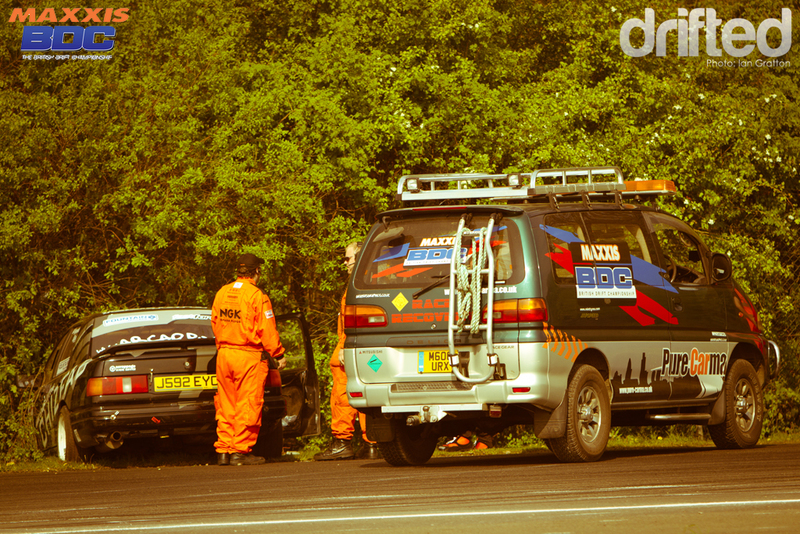 Whereas some keep a keen eye on the start-line marshall, ready to launch at the first sign of the flag drop. Send it! 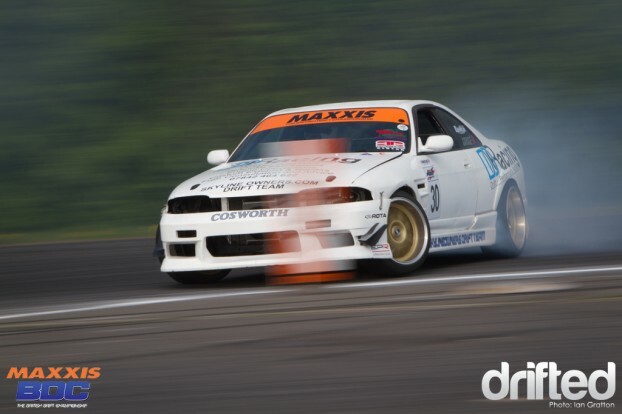 Nathan Chivers returns to the BDC in 2011 in his GDA/Autoglym Kouki S14a. Nathan was putting down some crazy smoke in practice! 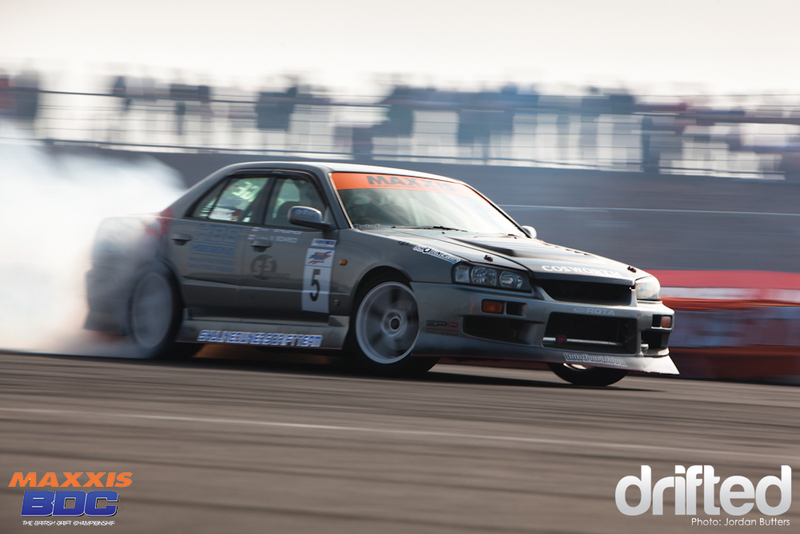 Gary Hughes lays down some tracks in his R34 more-door. I love seeing these big machines running alongside the smaller sports-coupes. 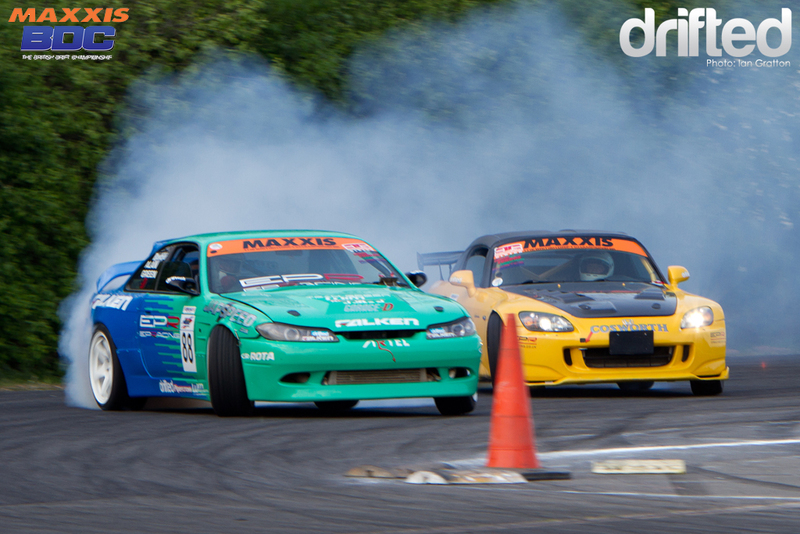 Which other motorsport brings the variety of cars that drifting does? 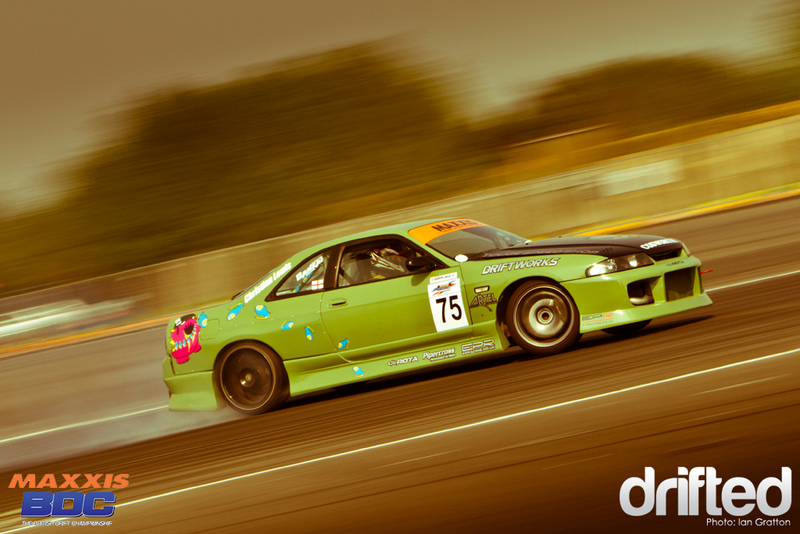 There appears to be lots of R33 skylines in the BDC field this year and quite possibly the noisiest is that of Ian ‘Bizz’ Philips. 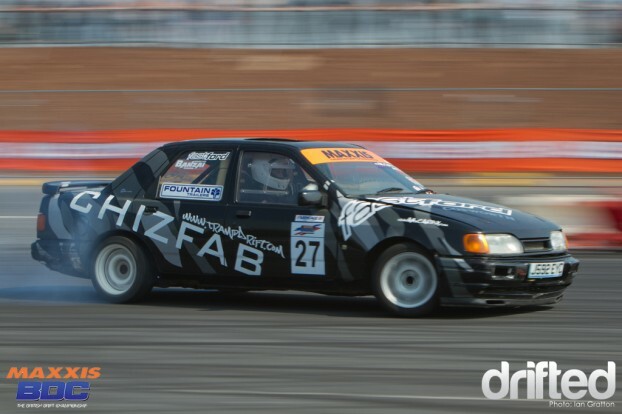 This LS3-powered car gives out a savage bark from its exhaust as it smokes round the course. Moments later the clipping point sign and the front bumper exploded. Jordan Patton’s car was one of two white R32 skylines running in the championship – the other being driven by Andy Stoud who ended up 6th in the Semi-Pro class. Jordan took 11th in Pro class – with a full field of determined drivers this years Pro championship is going to be stunning. 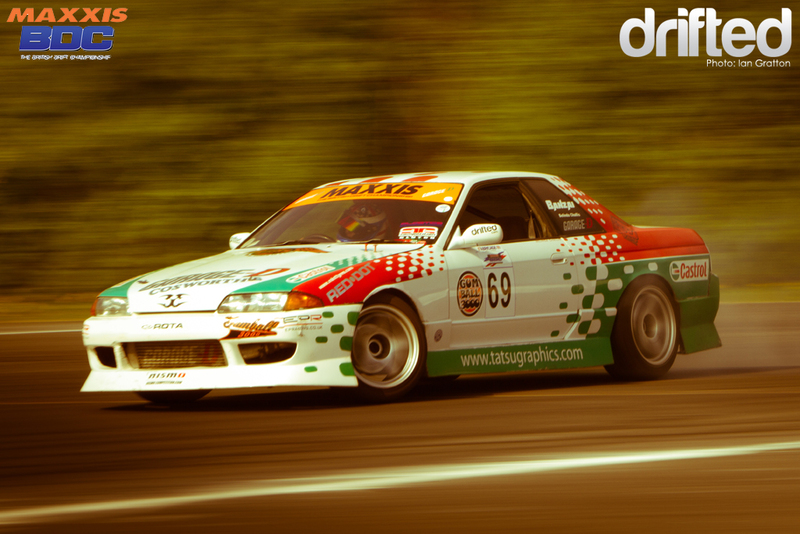 Belinda Challis was on top form in the Castrol skyline. She would be in for a busy day on the Saturday making her way to 3rd on the Semi-Pro podium. 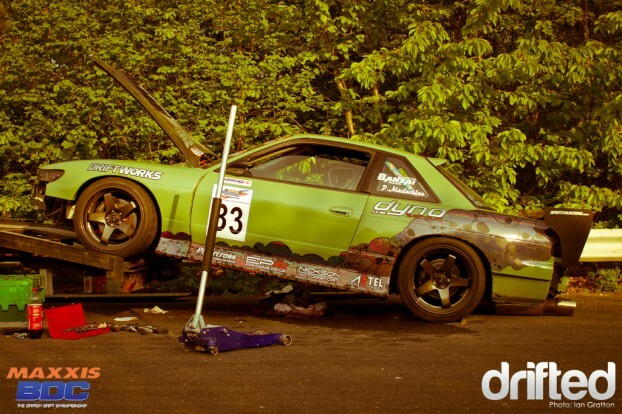 Danni Murphy’s S14a was back with a fresh lick of bright metallic green paint and an additional 100bhp to play with thanks to a new turbo setup. The paint on the car was so fresh that new stickers kept being added between the runs round the course. Sadly Adrian Brannan’s day was brought to a premature end towards the end of practice when he made a break for the woods. After rounding the first long sweeper Adrian tried to wring the neck of the Sierra to reach the second apex in one motion, sadly a lack of power caused him to grip and spat him into the Derbyshire woodland alongside the track. Watching a car go into the scenery is heart stopping as we tend to see the accident at is worst tracking the car so closely through a large zoom lens. The moments of silence after an impact are horrible – being close to the cars from our vantage points as photographers we cannot get involved – fortunately there is always the very experienced BDC safety crew and marshals who get to any incidents in super quick time. There is always a sigh of relief once we see the door open and the driver emerge. No squirrels were harmed in the harming of this Sierra. Hopefully the damage isn’t terminal. Jody Fletcher is another newcomer to the Pro class for 2011. 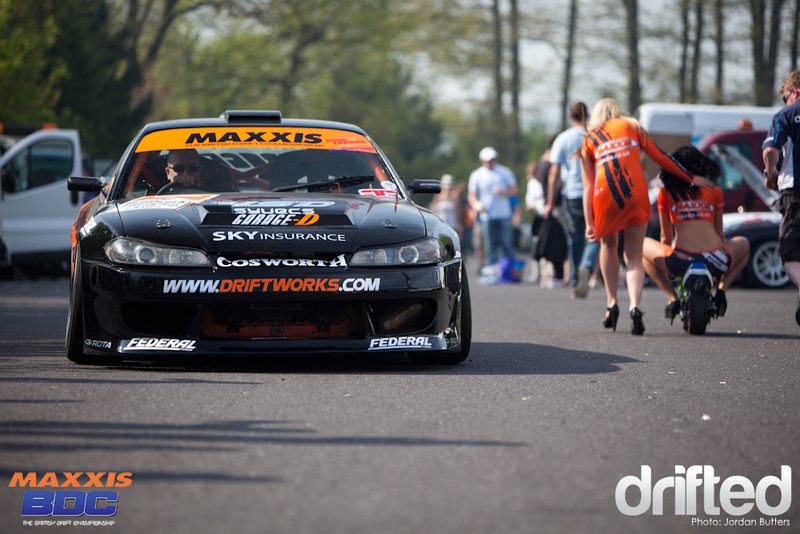 Jody’s S14 looks super-aggressive with the aftermarket S15 front-end and high-rise rear wing! There is a fantastic variety in the championship this season. 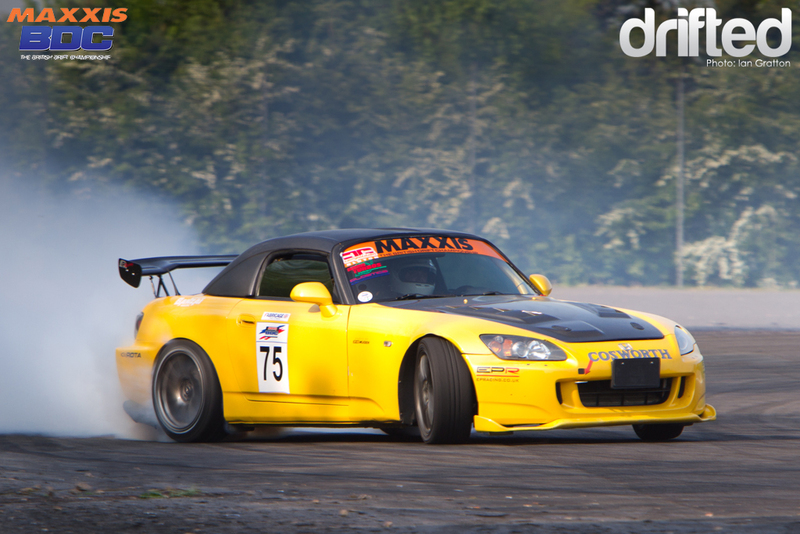 Ramunas Cepulis’s turbo’d S2000 is insanely fast whilst drifting. S2000s have such high grip levels that you have to charge hard when drifting them. Which is exactly why Ramunas won the ‘Hard Charger’ award at the event. Mark Lappage returns to 2011 with a bright pink paintjob and takes 2nd place. Semi-Pro winner Danni Murphy gives chase in the final. TJ Berney and Jody Fletcher aim for the first clipping point. 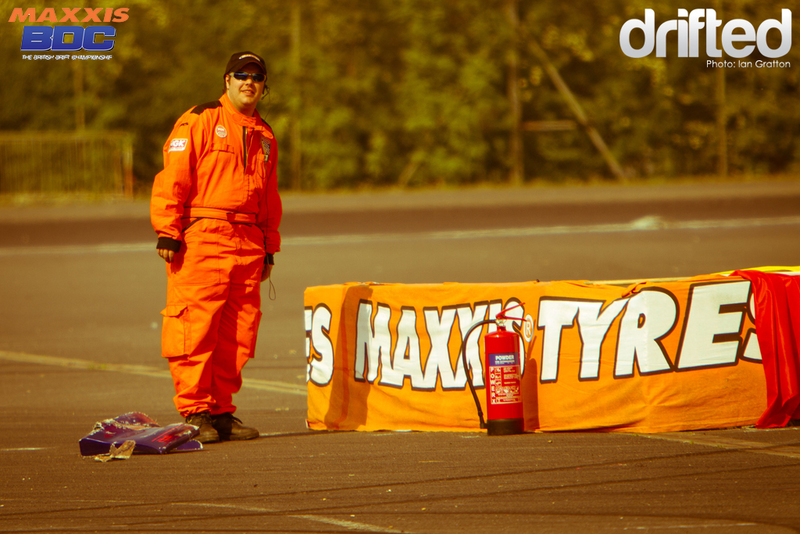 The new MAXXIS Clipping Points were replaced several times over the weekend! 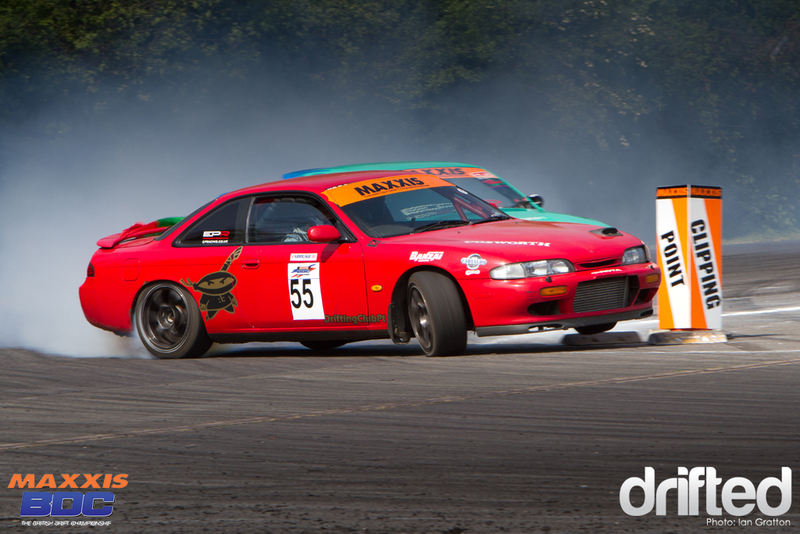 Portuguese Drift Champion Jose Lopez was in the UK for Round 1 of the BDC in a car he originally purchased in the UK to use in the Portuguese series. Believe it or not this S14 near-standard but none the less a good upgrade from Jose’s previous E30 BMW. 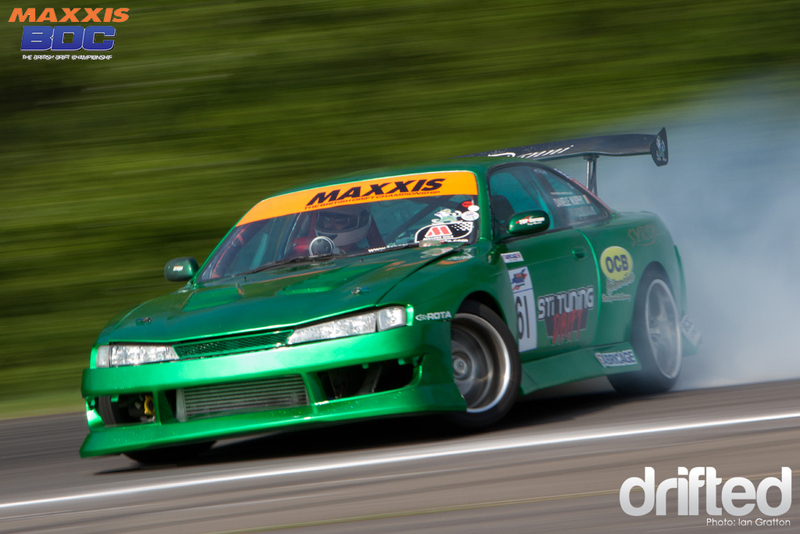 Team Falken’s Alan Green rounds the final corner closely following by the LHD S2000. Alan went on to take third place in Pro Class. 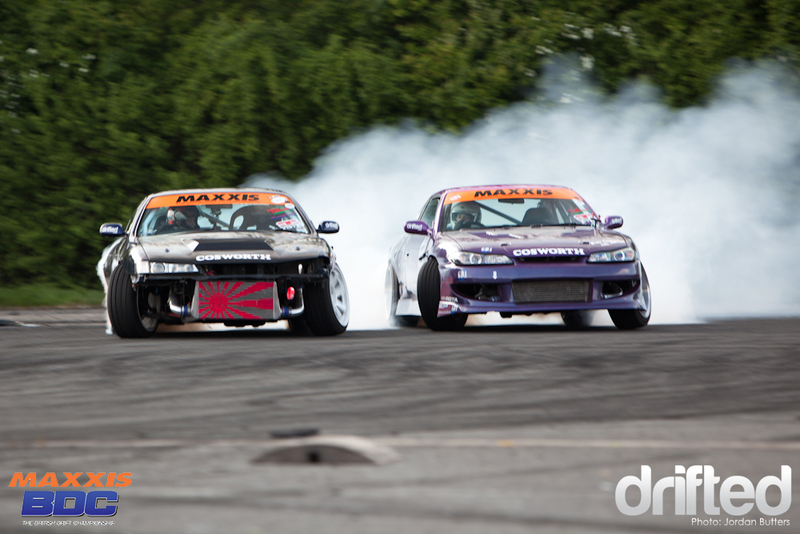 Grant Laker and Dan Hall make eye contact mid-drift! Awesome driving from both in the final! Grant took the win in the Pro Class. Keep an eye out for the Super-Pro coverage tomorrow!